If all of the world’s international migrants (people living in a country that is different from their country or territory of birth) lived in a single country, it would be the world’s fifth largest, with around 244 million people. 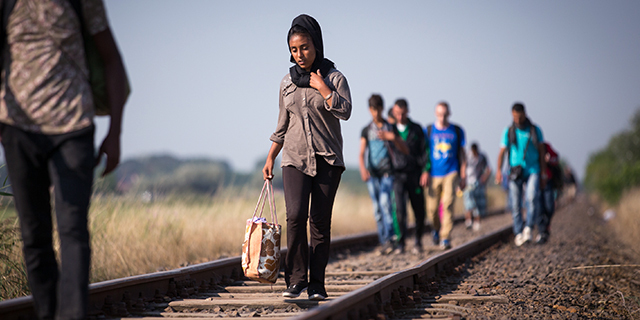 Overall, international migrants make up 3.3% of the world’s population today. Interactive: Origins and Destinations of the World’s Migrants, 1990-2015. In fiscal 2016, which ended Sept. 30, the U.S. resettled nearly 85,000 refugees within its borders, the most since 1999. As in Europe, there has been much discussion in the U.S. about which refugees should be admitted, both in terms of their origins and their religious affiliations. 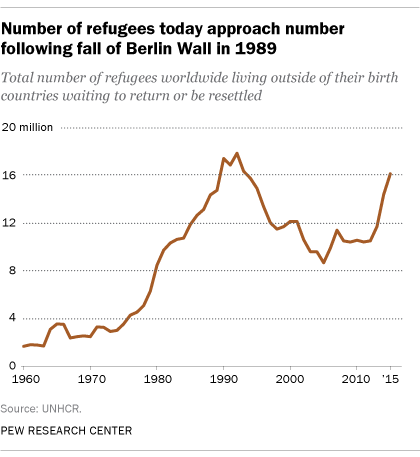 The U.S. has seen a shift in the origins of refugees, with most in recent years coming from Asia, Africa and the Middle East. During the 1990s, most were from Europe. 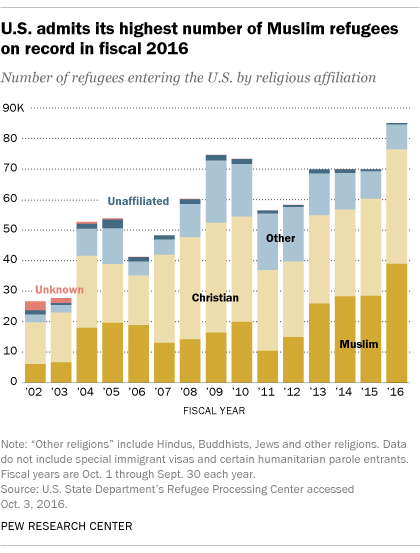 At the same time, a record number of U.S. refugees in fiscal 2016 were Muslim, with most coming from Syria and Somalia. Refugees are resettled all over the U.S., but more than half (54%) were resettled in just 10 states. Migrants also alter the demographics of their destination countries. Between 1965 and 2015, 59 million people immigrated to the U.S. Factoring in their children and their children’s children, the population of the U.S. is 72 million higher than it would have been had this level of immigration not occurred. In the same way, immigration is expected to be a major contributor to the growth of the U.S. population for the next 50 years, increasing the total number of people to a projected 441 million. If no additional immigrants were to enter the U.S. from 2015 forward, the country’s population would be about 338 million in 2065 – about the same as it is today. More recently, several European countries have seen their immigrant shares jump by 1 percentage point in less than a year as hundreds of thousands of refugees from Syria, Afghanistan, Iraq and other countries entered the Continent in 2015. 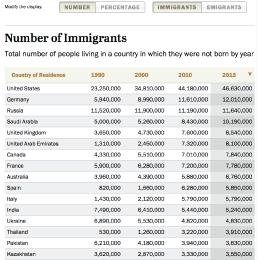 As a point of comparison, the immigrant share of the U.S. population increased by about 1 percentage point over a decade, rising from 13% in 2005 to about 14% in 2015. There can also be an impact on migrants’ countries of origin when they cross international borders, especially if they move in large numbers. In 2015, nine countries had 20% or more of their birth populations living in a different country. Large-scale emigration can have significant impacts on the demographics of nations. For example, Albania has seen many of its young adults leave for opportunities elsewhere. By comparison, emigration has been more common among highly educated groups in Trinidad and Tobago. In some instances, out-migration among particular groups can exacerbate population aging and leave significant skill gaps within these source countries. How do Americans and Europeans view immigrants? Americans’ opinions of immigrants have changed in recent years. In a new Pew Research Center survey, about six-in-ten U.S. adults (63%) say that immigrants strengthen the country through their hard work and talents. By contrast, about one-fourth (27%) say immigrants are a burden to the U.S. by taking jobs, housing and health care. The U.S. public’s views of immigrants have largely reversed since the 1990s, when 63% said immigrants were a burden for the country and just under a third (31%) said immigrants strengthened the nation. Some groups of Americans hold more positive views of immigrants than others. For example, Democrats recently have been more likely than Republicans to say immigrants in the U.S. are a strength for the country. Also, younger age groups tend to hold more positive views than older generations. Immigration was a top issue in the 2016 U.S. presidential campaign, and the divide between Democrats and Republicans on immigration issues has been stark. In another survey by the Center conducted in early August, nearly eight-in-ten voters who supported President-elect Donald Trump favored building a wall along the U.S.-Mexican border, while only one-in-ten voters who supported Democratic candidate Hillary Clinton favored it. Nonetheless, the majority (60%) of Trump supporters said that undocumented immigrants should be allowed to stay in the country provided they met certain requirements. By comparison, nearly all (95%) of Clinton supporters said the same. In Europe, the recent surge of refugees has made some Europeans wary of the immigration situation in their countries. In eight of 10 European nations surveyed in spring, half or more adults in those countries said incoming refugees increased the likelihood of terrorism in their countries. Similarly, half or more adults in five of the 10 countries surveyed said that refugees would have a negative economic impact on their countries, taking jobs and social benefits. As the influx of different races, ethnic groups and nationalities changes the face of Europe, few Europeans say that growing diversity makes their country a better place to live. In none of the 10 nations surveyed did a majority see increasing diversity as a positive. The same survey found Europeans sharply divided about whether refugees leaving Iraq and Syria were a major threat to their countries.